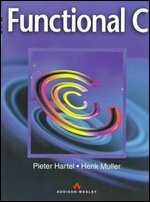 Functional C teaches how to program in C, assuming that the student has already learnt how to formulate algorithms in a functional style. By using this as a starting point, the student will become a better C programmer, capable of writing programs that are easier to comprehend, maintain and that avoid common errors and pitfalls. All program code that appears in Functional C is available on our ftp server - see below. How to find a code fragment? To access a particular code fragment, use the book to locate the section or subsection in which the code fragment appears, then click on that section in the code index . This will open the appropriate page at the beginning of the section. The code fragment may then be selected using the copy/paste facilities of your browser. Each chapter is represented by a separate page, so as an alternative to the procedure above you can use the save-as menu of your browser to up-load all code fragments in a particular chapter at once. Also available on our ftp server is errata for Functional C.